We live in an era of mass urbanisation. Australian towns and cities are growing and our public and active transport networks are needing to work harder to keep people moving seamlessly across our cities. Here in Western Australia, the Public Transport Authority (PTA) and Department of Transport (DoT) strive to ensure this is the case. Their strategies set out plans to improve accessibility and ease of use for the public and active transport networks, encouraging more use, reducing pressure on roads and in-turn allow easy movement by the public. To make sure they are delivering on these; the PTA and DoT require a holistic understanding of user journeys on the transport network. With that in mind, both organisations approached Painted Dog with core requirements to increase this understanding, focusing on users’ accessibility to transport networks and any potential pain points they may experience. Staying true to our values, we wanted to develop an innovative approach that went far beyond traditional methods, enhancing reliability and accuracy of the data for our clients. The approach needed to look at an individual level – focusing on exactly where people were travelling from on their journey, where they were trying to get to, and where along this path they encountered problems. We needed to ensure absolute accuracy and reliability, while also reporting the outputs in real-time so client stakeholders could quickly identify issues that needed immediate attention. To make this a reality, us dogs worked to develop our very own integrated geomapping survey tool which was capable of capturing this data in an accurate and user-friendly way. By integrating a trusted and up-to-date mapping provider into our survey questions, respondents were able to easily and precisely mark locations on a map, identifying their point of origin, point of destination and specific accessibility issues including broken or missing footpaths, street/pathway lighting issues, broken glass/rubbish and difficult roads or intersections to navigate or cross, just to name just a few. 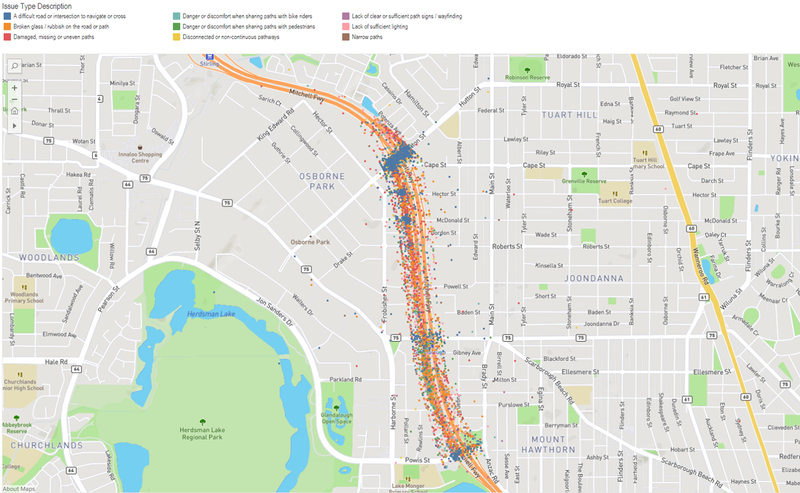 By partnering with PTA and DoT on these projects, Painted Dog has created a user-friendly pin drop geomapping tool that provided them with real-time updates of users’ journeys through an interactive online dashboard. The result sees each individual journey overlayed over one another as they are collected, building to tens of thousands of points. This allows conclusive patterns to form over the fieldwork period, and when these co-ordinates are overlayed with the rich open ender data also collected in the survey, vivid insights emerge. The interactive map-based reports produced through our geomapping tool were subsequently overlayed with independent isochrone mapping to ensure their validity and were found to be extremely accurate. While this application of geomapping is transport industry-specific, this technology allows any organisation to collect accurate, real-time geographic data from their target market. Perhaps an insurance company would want to accurately plot home break in claims by street address to establish trends, or maybe a property developer would want to know what aspects of its new estate the residents are satisfied or dissatisfied with? The power of this tool comes with its accuracy and application – not only does this allow maps to be populated with rich and precise data points, but clients are given access to an interactive portal that give them the flexibility to evaluate their results by different population sub-groups, geographical areas, or any other variable of interest. 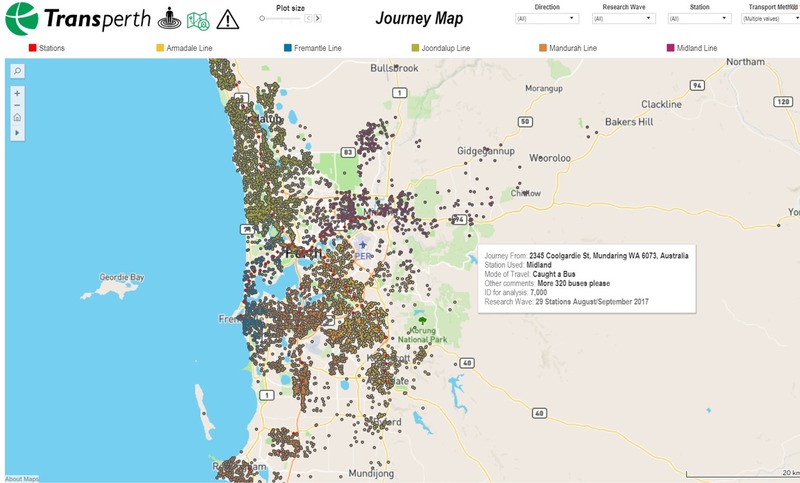 By taking advantage of the accurate mapping technology being developed and improved every day, Painted Dog now has the tools to make use of this information and pass invaluable location-based insights to our clients, moving from we think, to we know!